Finding a 100% natural lip gloss is more challenging than you might think. Many companies call themselves “green,” natural,” and “organic” but you’ll still find synthetic chemicals, dyes and petroleum products in their ingredient lists. Not so with Revolution Organics. They’re the real deal. Not only does their lipgloss not contain synthetics, chemicals, parabens, petrochemicals or artificial ingredients, at least 85% of the ingredients are certified organic. There are 5 shades to choose from, and I have tested three of them. I bought “Integrity” (the one in the middle) at least six months ago and am due for a new tube as I wear it almost daily. It’s a lovely “your lips but better” (YLBB) rosy shade with the slightest suggestion of warm shimmer. The consistency is perfect as far as I’m concerned. It’s got a little bit of that thick texture you want from a gloss so that it clings and lasts on your lips, but it never becomes goopy or overly sticky. It glides on effortlessly, feels incredibly nourishing and has absolutely no scent. “Vibe” (on the far right) is also a YLBB gloss, but is a brownish peachy color that got a little swallowed up by the pigment of my lips. I prefer “Integrity,” but would love to see “Vibe” on someone with a lighter complexion. 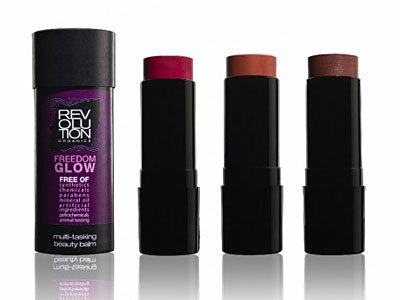 Finally, “Truth,” (second from the left) the brightest and darkest of the three creates a stunning sheer-fuchsia lip. It looks much darker in the tube than on your lips, but compared to “Integrity” and “Vibe” it is more pigmented and also has a more noticeable sparkle. Since I am so inclined to love pink, “Truth’s” hot-pink cuteness is hard to pass-up. If it wasn’t enough to nail it in the lipgloss arena, Revolution Organics also has put out a mighty fine blush. They call it a Beauty Balm since it can also be used on the lips, or anywhere you choose to put it on your face. As pictured above, the colors from left to right are: “Blushed”, “Sunkissed” and “Bronzed”. “Blushed” is like the stick version of the “Truth” gloss, a bright hot pink that is beautiful, but admittedly a little intimidating for me to put on my cheeks. I applied it very lightly with my fingertips which gave me that “just in from the cold look” and was very flattering on my olive toned skin. Any more than a light tapping and blending, and I would have swiftly moved into clown territory. On the lips, “Blushed” is gorgeous. I don’t normally go for such intensely bright pinks on my lips, but it’s easy to control “Blushed’s” color when applied with your fingertips. And when you swipe a little “Truth” lipgloss on top, it’s a knock-out! “Sunkissed” is a peach blush that has both brown and pink in it, creating a very natural look. I applied the stick directly to my skin, and then blended with my fingers. I did the same with “Bronzed” which is a brown toned bronzer…no orange to be found in there! I loved the warm, subtle glow it created. All of the Beauty Balms create a dewy look and feel very moisturizing. Like the lipglosses, the Beauty Balms have no scent, are 100% natural and are made with 85% certified organic ingredients. I was also able to sample the All-Over Skin Creme, Lip Balm, and All-Over Body Balm. The Skin Creme is wonderful. It has a lovely citrus smell, moisturizes effectively and comes in a tube that fits easily into your handbag. I’m heading to San Francisco this weekend, and it’s coming with me! The Lip Balm didn’t impress me as much. The texture was too thin, and frankly, my holy grail is Dr. Hauschka’s Lip Care Stick and that’s hard to compete with. On the other hand, I did really like the All-Over Body Balm as a lip balm. Not quite as much as my Dr. H, but almost, and that’s saying a lot.